What Does it Mean? Mystery No Longer! What exactly is the cause of this mysterious light coming on? Unfortunately, there’s no one simple answer. 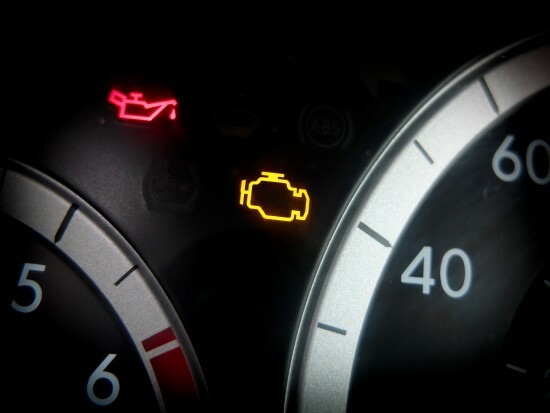 It could be any number of issues -most often fuel or exhaust system-related- but to give you an idea of what it could be and just how seriously you should take it, here is a list of the most common reasons a Check Engine Light will come on. Yes. Your gas cap can undermine your entire vehicle. If you attempt to drive with a damaged, missing or improperly installed gas cap, fuel vapors can leak out and throw the whole fuel system off. This also causes a reduction in gas mileage and increases emissions. TIP: Gas caps are cheap. Higher fuel costs are not. Make sure your cap is properly sealed whenever you drive and if it gets damaged or torn off its tether, replace it right away. The oxygen sensor monitors the unburned oxygen from the exhaust. The mass airflow sensor monitors the oxygen entering the engine. Faulty sensors can’t provide the right data to your vehicles’ computer and that reduces the computer’s ability to monitor and alter the oxygen and fuel mixture. Faulty sensors not only hurt gas mileage, they also increase emissions. TIP: Not repairing these simple and relatively inexpensive parts can lead to a ruined catalytic converter which is a much bigger deal and a much more expensive part to replace. Some new vehicle spark plugs can go upwards of 100 thousand kilometres or more, but all spark plugs and wires eventually wear out. When they do, you may hear knocking or feel a shudder or hesitation as your vehicle accelerates. TIP: As with most everything else on this list, worn out plugs and wires will significantly hurt your mileage and performance and likely cause even more serious problems as well. If your catalytic converter fails, you are in for a significant repair bill. The catalytic convertor is a critical part of your vehicle’s exhaust system that converts carbon monoxide into less harmful emissions. If your catalytic convertor is failing, you’ll notice a serious decrease in gas mileage and performance. Essentially your vehicle can’t breathe properly. TIP: Your catalytic convertor shouldn’t fail if you’re properly maintaining your vehicle. Typically, a converter will fail only after a vehicle is allowed to operate with bad sensors or plugs or wires (or all of them!). If you think you’re saving money by ignoring the light on your dash, think again. Listen to the light. It’s doing its best to help you save money! If you choose to ignore your check engine light, you are throwing your money away by allowing your vehicle to run less efficiently AND, you are very likely inviting much more expensive repairs to happen further down the road.